To access the 'Auto Provider Reconciliation' feature from the menu bar of the main TeleTracker Online screen, click Utilities, then Auto Provider Reconciliation. To open an existing Auto Provider Reconciliation, select the transaction from the list and click the Open button. The Auto Provider Reconciliation window will appear. 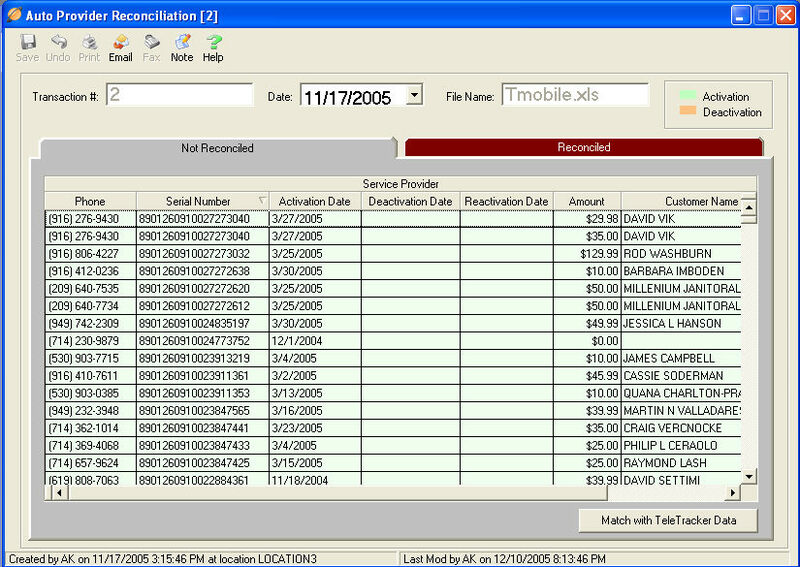 When the original transaction was saved, TeleTracker Online saved the Service Provider Commission worksheet. The file can bee seen in the File Name field. In this window you can see both Not Reconciled and Reconciled Activations. If an Activation(s) within TeleTracker Online has been updated or modified, you may repeat the matching process as seen in the Match with TeleTracker Online - Step 3 help file.